2014 was another year full of ups and downs, and the we have had quite a few recently. Chamberlain uses a Nova Chat, which is a speech communication device. For some reason this is not a covered item through insurance, and it is quite pricey. We submitted numerous appeals with letters from all the big hitters in C’s life (our ped and therapists) and peer reviewed journal articles. However, they still said NO. Variety Children’s Charity of Greater Kansas City was able to provide assistance with getting a Ipad version of it of the Nova Chat. We are very excited. We have received most of the items to make this speech device work for C. Having a visual impairment and gross motor delays, it is very hard for him to communicate. This device will allow him to start communicating his needs and wants. So if you ever need or want to support a fantastic charity, Variety is near and dear to our hearts. Another incredible event recently was an anonymous donation to our family to use for Chamberlain. We have decided to invest in a lift for our minivan (which is the most awesome vehicle ever). It is something that we will be able to use for a long time and move to another vehicle when the time comes. This is so very exciting. C’s Zippy is heavy, but as he grows his subsequent chairs will be even more heavy. The lift will be something that “lifts” the chair out of the back of the van and lowers it to the ground and also does the reverse. C got to visit the Big Guy this past weekend. 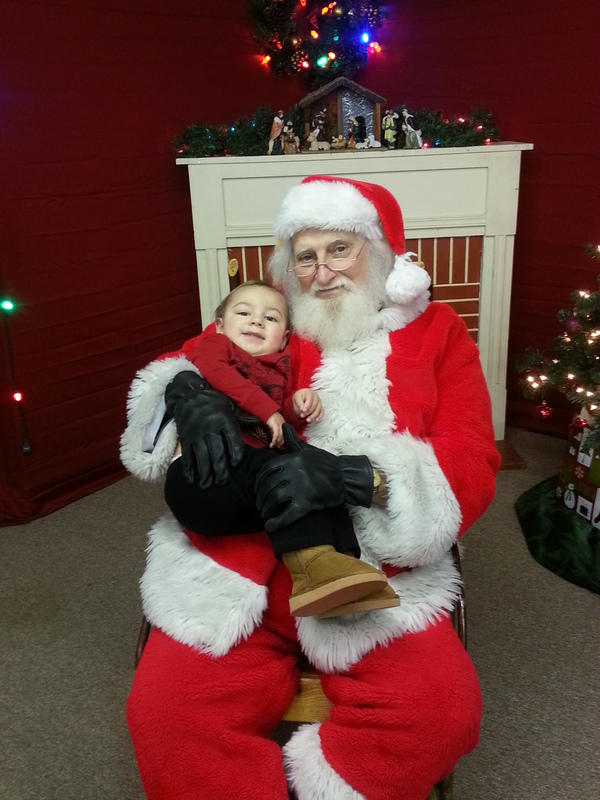 He seemed happy about getting his photo taken with Santa. Before he would pose, he had to check out the surroundings first. It was a fun family event. Santa was super. 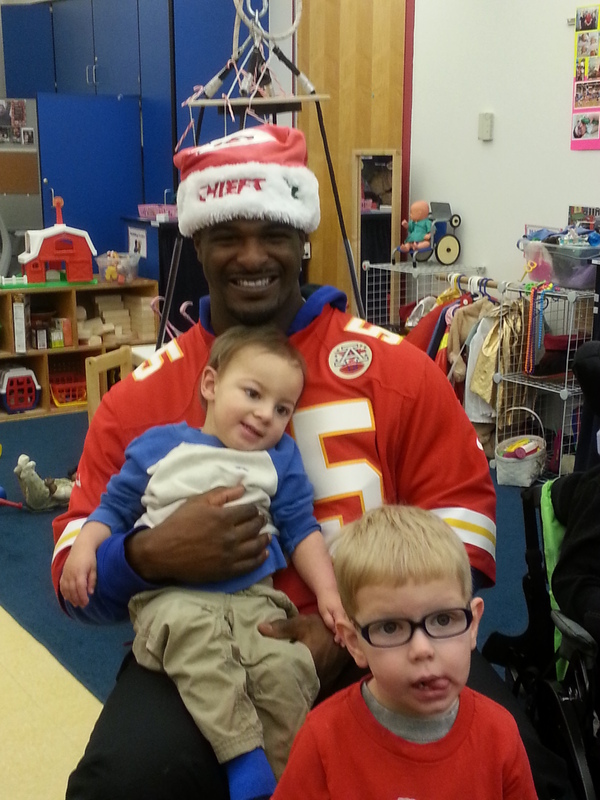 He also got to meet some Chiefs Rookies at his preschool. He seemed very happy about that too. Go Dee Ford!!! See both pics below. We are the new owners of a Kid Walk. This is a gait trainer/stander. C absolutely loves it. He has been moving it forward some, and can go backwards with ease. Jeff and I love it, it is so perfect for him. It supports in all the right places for our kid and we could not be happier. This is a piece of equipment absolutely necessary for someone who cannot stand or walk. The body needs that input to grow and develop probably. Chamberlain’s hips are 20% subfluxed. This means his hips are not fully in the sockets about 20% out. If they become 30% subfluxed, then it means surgery. If that surgery doesn’t work, then one more surgery. We would like to avoid both surgeries and are hopeful this will help us do it. But ultimately, we must avoid total dislocation. This can be very painful and once you get to that point nothing can be done. C’s seizures are back and in full effect. We made a switch to a new Neurologist who is in the Epilepsy clinic. We are very happy with this change. And he has suggested trying the ketogenic diet for Chamberlain. The ketogenic diet is a last resort, typically after three failed seizure medicines over a course of a specific amount of time. We have tried four meds and had success with three of them for almost a year. Now they are not working, and the chance of a different med working is slim to none at this point. We have also tried all the top notch meds. So we are going to try the ketogenic diet. It is a huge undertaking and requires some major changes. Doctors don’t know how or why this works for seizure control, but it does for about half of those who try it. We have been reading a lot about it and preparing for this change. It requires an inpatient stay, which should occur in mid January. We are very hopeful for seizure control. This monster cannot be allowed to continue to terrorize Chamberlain. It can cause additional damage and can change and evolve. It can also do worse, so we are not messing around. We have had some illness recently and are trying to keep this kid healthy for the pending inpatient. When C gets sick it takes him a really long time to get over one illness. It hits us really hard. Last year he was back to back, so he has been hanging out with mama a lot lately. Thank goodness for work flexibility!! I cannot be more blessed to have such an incredible boss and work for such a wonderful company. Jeff is also able to flex his work schedule which is a tremendous help and gift for our family. We are looking forward to Christmas break and the New Year. 2015 will be a whole new adventure for the Franklins.